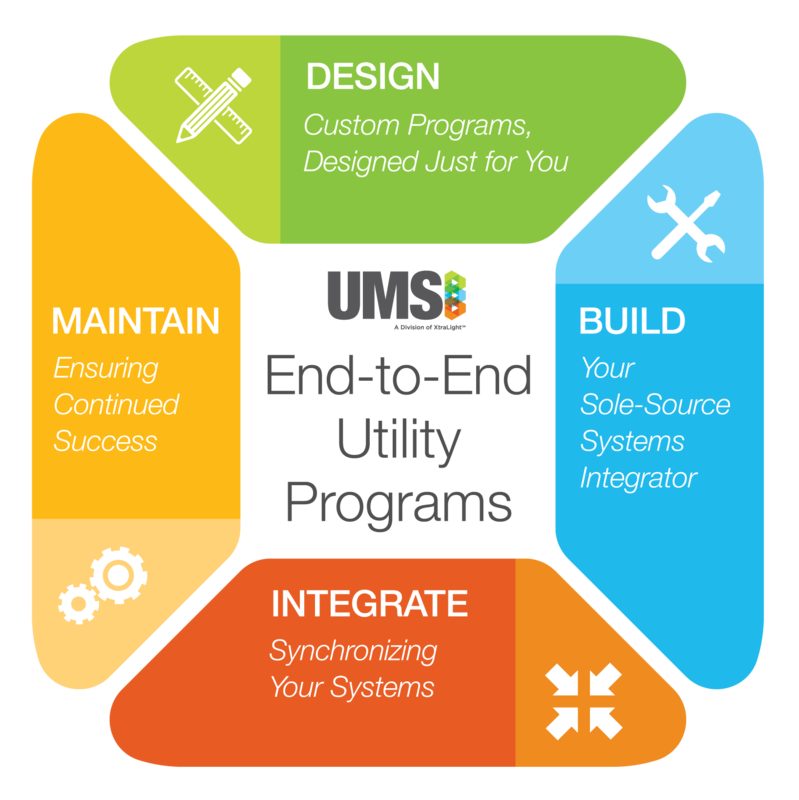 UMS specializes in the integration of custom end-to-end utility programs, including Advanced Metering, Billing Systems, Smart City Design & Integration, Network Lighting & Controls, and Water Conservation. Our team possesses decades of hands-on experience, a successful track record of rapid and efficient deployments, and robust project management capabilities. We pride ourselves on “doing,” and not just advising clients what needs to be done. By taking advantage of our comprehensive end-to-end programs, utilities and municipalities not only save money, time, and resources, but realize a more successful outcome. End-to-end programs are comprised of four stages: Design, Build, Integrate, and Maintain. quantify how the program will be financially and operationally beneficial. identify risks and success-defining metrics. But we don’t stop there. With new programs comes more data. Our in-house data integration specialists help determine the best and most cost-effective software solutions for meter data management (MDM), billing, revenue and financial management, customer engagement, and payment services systems, and will assist in designing a custom implementation plan. eliminates the hassle of managing multiple vendors on your own. To ensure the project stays on schedule, our dedicated project management team develops and manages a custom deployment plan tailored to your utility’s specific needs. They key to a successful efficiency program isn’t gathering new and more data, but ensuring your data is properly synchronized with existing systems. Our in-house software engineers have extensive experience making third-party systems “talk,” ensuring your staff has the information needed to make smarter decisions and meet organizational goals. UMS doesn’t pack up and go home once your project is complete. Our maintenance services are available to ensure that your utility’s new program is not only meeting, but exceeding expectations, as well as to lead staff in successfully adopting new processes.